Despite mixed reaction, players say they’re excited to try on new threads. (Rick Egan | The Salt Lake Tribune) The Utah Jazz will play on their new City edition court with their City Edition Uniforms, Tuesday night. Monday, January 29, 2018. (Rick Egan | The Salt Lake Tribune) The Utah Jazz will play on their new City edition court with their City Edition Uniforms, Tuesday night. Monday, January 29, 2018. (Rick Egan | The Salt Lake Tribune) The Utah Jazz will play on their new City edition court with their City Edition Uniforms, Tuesday night. Monday, January 29, 2018. (Rick Egan | The Salt Lake Tribune) The Utah Jazz will play on their new City edition court with their City Edition Uniforms, Tuesday night. Monday, January 29, 2018. (Rick Egan | The Salt Lake Tribune) The Utah Jazz will play on their new City edition court with their City Edition Uniforms, Tuesday night. Monday, January 29, 2018. (Rick Egan | The Salt Lake Tribune) The Utah Jazz will play on their new City edition court with their City Edition Uniforms, Tuesday night. Monday, January 29, 2018. (Rick Egan | The Salt Lake Tribune) The Utah Jazz will play on their new City edition court with their City Edition Uniforms, Tuesday night. Monday, January 29, 2018. (Rick Egan | The Salt Lake Tribune) The Utah Jazz will play on their new City edition court with their City Edition Uniforms, Tuesday night. Monday, January 29, 2018. (Rick Egan | The Salt Lake Tribune) The Utah Jazz will play on their new City edition court with their City Edition Uniforms, Tuesday night. Monday, January 29, 2018. Shoe-gazing at an NBA practice, one of the few things that rarely turns up is unity. Players wear different models, different brands and often different colors. So it was notable on Monday at Jazz practice that several members of the team were wearing red shoes: Donovan Mitchell, Royce O’Neale and Joe Ingles among them. Is it related to Utah’s redrock-themed City Edition jerseys and court that debut Tuesday night against the Golden State Warriors? The jersey, which has already been on sale for the last week in the team store, has generated both praise and scorn for its vast departure from the conventional Jazz look. But either way, it has definitely generated buzz. Mitchell has been among those to praise the look, while other players are more ambivalent. The jerseys, along with the custom-designed court with a matching color gradient around the border, is expected to be one of the most distinct uniform combinations in Nike’s new NBA line. Even coach Quin Snyder, who ranks jersey variations far down in his list of personal priorities, seemed interested to see them in a game. Snyder, however, said he wouldn’t necessarily be worried about wearing an outfit to match. The bigger question, of course, is how the Jazz will fare against the Warriors (40-10), the defending NBA champs who trounced Utah with a 4-0 sweep in the playoffs, as well in the last meeting on Dec. 27 with a crushing third quarter rally. The Jazz, who have now won back-to-back games for the first time in a month-and-a-half and enjoy a three-day break before the game, are hopeful their defense is shaping up to being able to stay competitive with a historically great team. 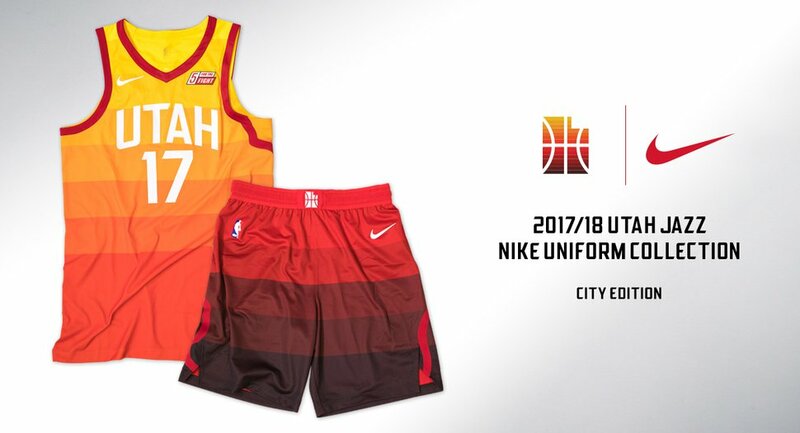 The Jazz "City" design uniforms, the fourth edition designed by Nike, will feature a color palette inspired by the landscape of Southern Utah. It features a gradient color scheme from gold to dark brown, side designs featuring road routes to St. George and Moab, and a specialty designed "Jazz State" logo on the waistband. The Jazz will debut the jersey on Jan. 30 against the Golden State Warriors and wear them in nine games this season. The uniform will be available to consumers in March. Graphic courtesy of the Utah Jazz. Snyder said there has been an extra crackle of electricity in practice the last two days that comes with preparing for a team like the Warriors. So every edge counts, even red shoes that might add a little energy to practice. Ricky Rubio said while the team hasn’t gotten the new jerseys yet, he’s feeling some anticipation. “Let’s see how it fits tomorrow,” he said.